My name is Andres Roncal. I am from Lima-Peru on my third year of architecture school at Pratt Institute in Brooklyn NY. I have a particular interest in passive systems and green architecture. I specialize in concept designs, schematics, programming, 3D modeling, rendering, product design, exhibit design, presentation drawings, plans, and shop drawings. I have certificates in Design Assistant and BIM/CAD operator technologies. I am currently doing freelance jobs of architectural visualization and 3d modeling. Grand Hall is a freshman dormitory case study for Pratt Institute. It explores a new approach of living and integrating students to the Bed-stuy / Clinton Hill communities in Brooklyn, NY. The proposed program is meant to burst the bubble in which Pratt students are forced to live in and give public space back to the landscape of the city. By mapping the public parks around the area it became evident that there were only two public parks available to the immediate community. Fort Green Public Park and Pratt Institute's Sculpture Park; the latter gated and limited to no public access. This segregation was reflected in the lack of understanding for the students to their surroundings which then increased the naive self exposure to crime in the area. The site is located in the Historic District of Fort Green at the corner of Grant and Myrtle avenue. The proposed building is to be raised at the ground level to canopy over a public park which infiltrates into the center of the city block to maximize the public area creating a court yard effect. It creates a platform in which freshman students will get to interact with their surrounding community. The building itself has a courtyard shape framing the center of the park showcasing constructed wetlands where light is reflected from inside facades to maximize sun light gains. The program is reduce to 34 bedrooms, two main kitchens, a small cafe at the ground level, green roof, and wide hall ways for 95 students. The crowed bedrooms are to be inhabited by students from diverse background and majors to encourage exposure to various ideas and talents, as well as encouraging them to go outside and find comfort in the outdoors while exploring the city during their first year in NYC. The program has four layers of circulation. One on the far north west side of the building, two on the center core and the last one on the south west corner. Fire stairs and main elevators are located on the far north west corner with doors to the main lobby and outdoors. Both activate every floor and act as structural elements as well as MEP distributors. Secondary circulation goes around the main core and perimeter of the building horizontally connecting every floor. The last one in the south west only activates three floors of the building and creates direct access to the two auditoriums. The location of the site has a particular condition that constantly exposes the South East face. A double skin facade is used to act as an insulator on the SE face and reflect some of that energy into the bedrooms. 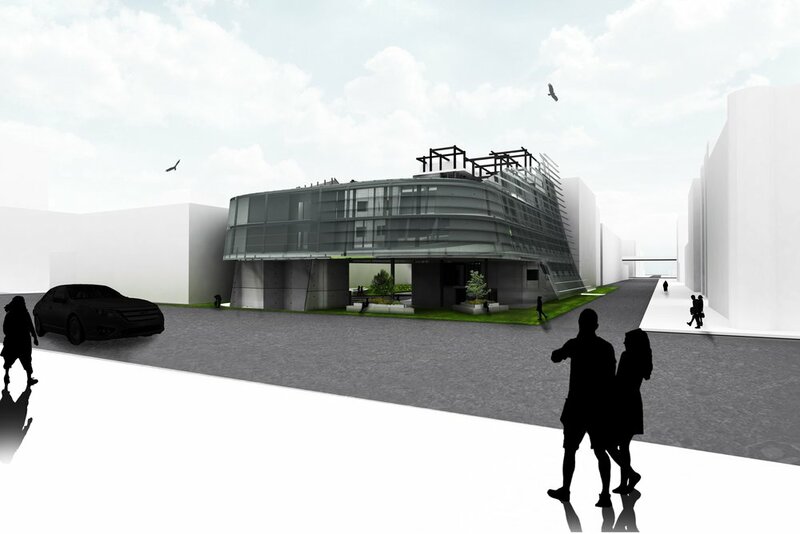 The building implements multiple passive systems to act as a living machine to reach Net Zero usage of mechanical energy. Passive sun gains, ventilation, cooling, thermal mass, green roofs, constructed wetlands and suds working together to improve and minimize usage of energy and create awareness among the student body as well as the community.